Backed by streamline infrastructure, we are engaged in manufacturing a wide array of dummy torso, normal dummy torso and adjustable dummy torso. These are manufactured using quality raw material like plastic, steel and others, to ensure durability. Our range is light weight and available in different bases. These are designed to meet the requirements of various apparel, fashion, retail and other commercial applications. We also customize our range as per the specifications and requirements of our clients. We offer our clients Adjustable Torso that are widely used in various apparel, fashion, retail and other commercial applications. These are manufactured using best quality material and known for light weight, natural flesh tone, scratch proof surface and perfect finishing features. Moreover, these are available in various shapes, sizes and colors as per the specifications laid down by our clients. We are one of the prominent manufacturers, suppliers and exporters of superior quality Male Torso Stand. These stands are manufactured using high-grade raw material, which is procured from the reliable vendors of the market. Clients can avail these stands in various designs, sizes, shapes as per their exact requirements. 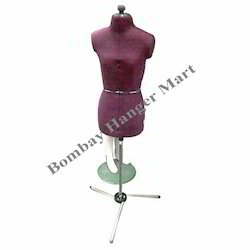 We have with us a range of Normal Dummy Torso that is available in various designs, shapes, colors and sizes. This is widely used for display various apparels in shops, malls, retail and other establishments. Manufactured using superior quality material, these are highly durable, lightweight and user friendly. Further, our range is available in different sizes and material specifications as required by the clients.